SanKritiLaya is pleased to announce the upcoming spring 2010 concert tour of U.S. and Canada by Shri N. Vijay Siva,Shri RKS and Shri JV. The concert schedule will be posted in this blog in the near future. 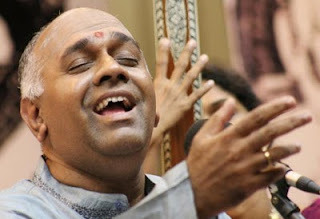 Vijay Siva is one of the foremost vocalists today in Classical Carnatic Music. A child prodigy, at the age of four, he exhibited a rare intuitive capacity to identify ragas. Vijay Siva had his initial tutelage in Carnatic music from his mother, Akhila Siva, a vocal musician from Chennai. Vijay Siva later became the disciple of the legendary vocalist, Sangita Kalanidhi late Shri D. K. Jayaraman. He later received guidance from the legendary Sangita kalanidhi late Smt. D. K. Pattammal. Vijay Siva is also an accomplished percussionist (mridangam), and received his training from Kumbakonam Shri Rajappa Iyer. Vijay Siva has performed in numerous and famed locations all over India and abroad including USA, Canada and Singapore. A recipient of numerous awards and titles, Vijay Siva has received recognition for both vocal and percussion (mridangam), including awards for devotional music in 1974 and the coveted "Rajaji Tamboora" in 1981 from Tamil Isai Sangam, Chennai. He was also awarded first place in Classical and Light Classical Music Competitions (1984) conducted by AIR. He is the recipient of prestigious titles: "Isai Peroli" (1995) from Karthik Fine Arts, the “Youth Award for Exellence” by Maharajapuram Viswanatha Iyer Trust in 1995, and the first recipient of “Kalki Krishnamurthy Award (1996)” by Kalki Krishnamurthy Memorial Trust, Chennai. 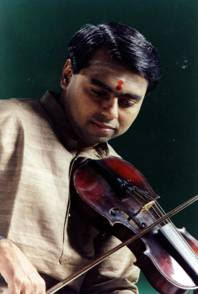 R. K. Shriramkumar is a top-flight Classical Violin artist of India. He belongs to the Rudrapatnam family of musicians; a family with a glorious musical tradition. He is the grandson of the much respected Vidvan Shri. R. K. Venkatarama Shastri. Having had his initial lessons in violin from Vidushi Smt. Savitri Satyamurthy, Shriramkumar was trained by his grandfather. He later received guidance from Vidvan Shri V V Subrahmanyam and also had training in vocal music from Sangita Kalanidhi Shri D K Jayaraman. His skills were further honed through the association and learning he gained by accompnaying the doyens of Carnatic Music like Sangita Kalanidhis Shri Semmangudi Srinivasa Iyer, Smt M S Subbulakshmi, Smt D K Pattammal, Shri D K Jayaraman, Shri Palghat K V Narayanaswamy, Smt T Brinda and others. Shriramkumar has provided violin accompaniment in several commercial recordings and has had the blessed opportunity of participating in a very unique recording entitled 'Divine Unison' featuring the great veterans Shri Semmanguid Srinivasa Iyer and Smt M S Subbulakshmi. A recipient of many awards, Shriramkumar has traveled far and wide on concert tours. Je also directed the music for a special television presentation on the Sringeri Sharada Peetam and has set to music a few compositions of the Acharyas of the Sharada Peetam. Shriramkumar has been conferred the prestigious “Isai Peroli” title (2009). Shri J. Vaidhyanathan hails from a Family of Great Musicians. He is the son of Legendry Musician Sangita Kalanidhi Shri.D.K.Jayaraman and Nephew of Padmavibhushan Sangita Kalanidhi Smt.D.K.Pattammal. He is the disciple of Sangita Kalanidhi Maestro Dr.T.K.Murthy. He has accompanied Great stalwarts like Sangita Kalanidhis Bharat Ratna Smt.M.S.Subbulakshmi, Semmangudi Srinivasa Iyer, Smt.D.K. Pattammal and Smt. M.L. Vasanthakumari; Lalgudi Sri G Jayaraman, Sri S Balachandar and many other great Stalwarts. JV, as he is affectionately known, has travelled widely in India and Abroad. He is the youngest Mridangist to get the prestigious Kalaimaamani award from the Government of Tamilnadu in 2006.